As far as It accessories go, we can usually count on a bag or pair of shoes to blow up, but it's not all too often that a belt becomes the one most-coveted piece. But if any brand could pull off a style surprise, it's Gucci (the brand that basically dominated 2016). First, we saw the brand's signature logo belt pop up all over our Instagram feed. But the blogger favorite has found a second wind as a must-own among our favorite celebs. The cult item makes for an easy way to dress up a simple jeans-and-tee combination, but as proven by the looks below, it can also be used for more dressy ensembles. So if you're feeling ready to up your accessory game, take a cue from your favorite trendsetters and give the belted look a try! Read on to see how celebs are wearing their Gucci logo belts now! On Dakota Johnson: Gucci custom jacket and Double G Buckle Leather Belt ($420). Pair the belt with skinny black jeans and a rocker-worthy jacket for an edgy ensemble. On Alexa Chung: Gucci Princetown Leather Slipper ($595) and Double G Buckle Leather Belt ($420). Paired with Gucci's classic loafers, the belt takes on a menswear vibe. On Rosie Huntington-Whiteley: Saint Laurent Oversized Square Sunglasses ($345); Foundrae necklace; Reformation coat; James Perse Cotton-Jersey T-Shirt ($75); Gucci Double G Buckle Leather Belt ($420); Paige High Rise Sarah Straight Jeans (available 12/30) in Sachi; Tom Ford Miranda Leather Tote ($2950); Vetements Black Leather Ankle Boots ($1585). Add oomph to simple jeans and a tee with a statement belt. On Lou Doillon: Gucci blazer; Gucci Paisley Print Crepe de Chine Silk Shirt ($1390); Gucci Double G Buckle Leather Belt ($420). Use the belt to break up a multi-print look. On Romee Strijd: Michael Kors Mia Leather Chain Shoulder Bag ($1505); Gucci Leather Belt with Interlocking G ($375). Swap a black belt for brown for a more laid-back look. On Miranda Kerr: Saint Laurent Opium 2 Tassel Velour Crossbody Bag ($1250) and 59mm Sunglasses ($330); Gucci Clover Belt With Double G Buckle ($550). Go for glam by styling skinny jeans, black booties, and a party top with your waist-cinching staple. On Kendall Jenner: Stella McCartney The 70s Flare Jean ($390); Louis Vuitton boot; Gucci Leather Belt with Double G Buckle ($420). Try layering belted flares with a tee and statement coat. If it 'aint broke, don't fix it. Cinch your jeans, or use this to add dimension to a dress. To beat bulk, belt a heavy scarf or coat. Swap black for brown for a more casual look. Go for bold with an embellished style. 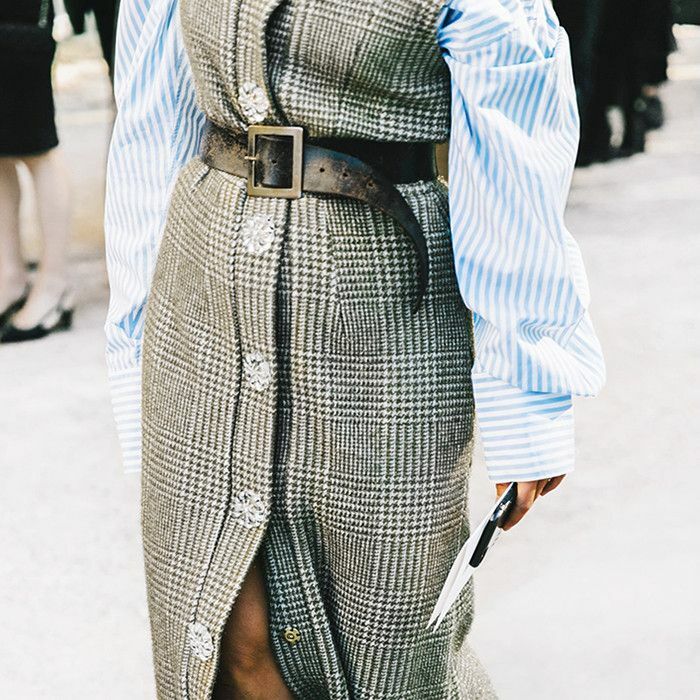 A D-ring belt adds a masculine tilt for a more tomboy vibe. A waist belt is an ultra-flattering accessory choice. If Saint Laurent is more your style, this is the piece you need. Want more accessory inspiration? This holiday must-have is just $2!